Following the course of human achievement, design battles the physical constraints of the world. Amid the forces of nature, the aging through climate, and the ravages of time, design battles for strength, utility and beauty. Create a structure to defy the gods of physics and leave behind a better place with acts of conscience and courage. For every action, there is an equal and opposite reaction. Structure holds us up. Our skeleton and muscular system hold us up. A tree has roots in the ground that anchor its outstretched branches. Structure is firmness. Structure is designed to resist forces of nature from all directions: gravity, weather, earthquakes and more. Structure must support loads - both live and dead. Dead loads are the weight of the materials themselves and any fixed or permanent matter such as roof, walls, floors and equipment. Live loads are loads that can shift or move over a period of time such as weather forces, snow loads and people. Research nature’s structure. Diagram a section of a tree and label its key parts: roots, trunk, branches, leaves. 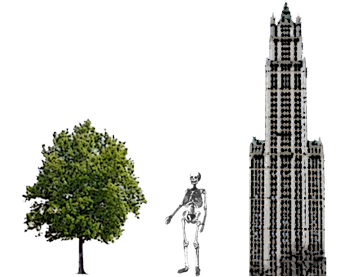 It is amazing that some trees can cantilever, or extend, without support branches wider than the tree is tall! The skeleton is the frame that supports our bodies, protects our organs and helps us move. Print off a drawing of the human skeleton and label the key bones and joints. What is the biggest bone? Identify a ball joint and a hinge joint. Identify the structural type for two different buildings. 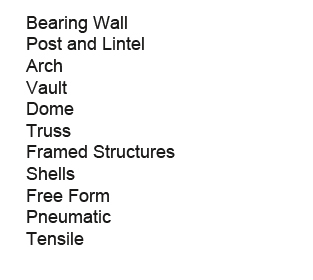 Find an example of each of the following types of structures: a trabeated, or column and beam structure; an arcaded system or series of arches or vaults, a cantilevered structure. Label each structure. 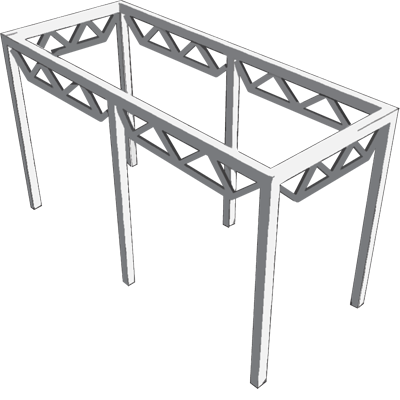 Look for repetitive elements that appear to frame or support the structure of the building. Label one a trabeated, or column and beam, structure. 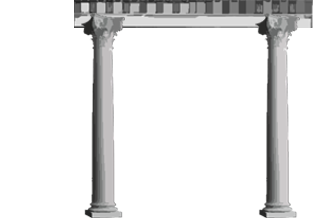 Label one building an arcaded system, or series, of arches or vaults. Two principal forces in any structure can be seen when you draw a line along the edge of a sponge to divide it into two sections. Bend the sponge. Notice that the holes on one side of the sponge are getting larger. This side is in tension. The holes on the other side are getting smaller. That side is in compression. Tension is like pulling apart and compression is like pushing together. Some materials are stronger in tension, others in compression. Take a look at the structural forces lab and explore forces on different materials. Columns - Try to support a book on a single vertical straw. Next, tape at least 6 straws together as a bundle and demonstrate the strength of the straws when used as a column to support the same book. Beams - Place two books approximately 5" apart. Put a 1" by 6" piece of cardboard across the books like a bridge with the flat side down. Push on the cardboard so it flexes. Fold the cardboard lengthwise and push cardboard down showing how much stronger it is in that direction. Architectural structure is designed to resist forces of nature from all directions- gravity, weather, earthquakes, etc. Structural systems have evolved over time with innovations in engineering, new materials, ideas about safety, and architectural expression. Structure must support loads- both live and dead loads. Dead loads are the weight of the materials themselves and any fixed or permanent matter such as roof, walls, floors, and equipment. Live loads are loads that can shift or move over a period of time such as weather forces, snow loads, and people. Look at the different types of structural systems.. Research one of the following structural systems. On one 8 ½” x 11” board, present the principles of the structural system, show photos of buildings which are constructed with your structural system, and build a small white model of your structural system and adhere it to your board. pulls objects towards the earth. is greater on the moon. The weight of an object. The distance between the posts. A beam that spans between two posts. What is support stress in building design? The way a material reacts to weight. An emotional problem the building has endured. The downward force of the building. The pushing together of objects. The pulling apart of objects. The way the structure reacts to weight. Which one is not a structural system? Video What is Structural Engineering?